15/09/2011 - EAPN’s booklet on Active Inclusion explores the reality of the European Commission’s Active Inclusion Strategy, showing progress on implementation so far, highlighting good and bad practices and signposting key elements to making the strategy work at national and EU levels. 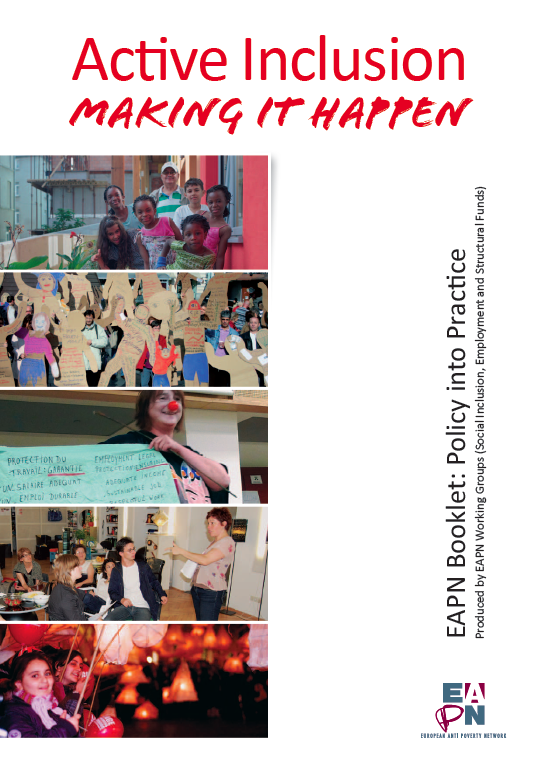 EAPN’s new booklet Active Inclusion: Making It Happen – Policy into Practice has been developed by EAPN Working Groups on Social Inclusion, Employment and Structural Funds with support from the EAPN Brussels Europe staff. It draws on national case studies proposed by EAPN national and European members, with the draft versions debated in the Working Groups’ meetings during 2010. By disseminating its members’ experiences and insights, EAPN hopes to help stakeholders and governments recognize the value of active inclusion strategies, and put Active Inclusion at the heart of new strategies to reduce poverty and social exclusion within the new Europe 2020 Strategy and to provide a fairer, more sustainable response to the crisis. Introduction: What is Active Inclusion? The Active Inclusion Booklet is also available in French – Polish – Macedonian. A summary of the Booklet is also available in Swedish.